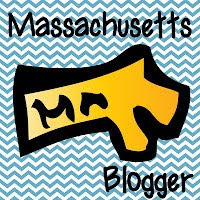 With progress reports done and less than a month until February vacation, I was feeling creative this week. So when a need arose during Morning Meeting, and some unuseable items needed discarding, inspiration struck! I used to think "Show and Tell" was too babyish for fourth grade. 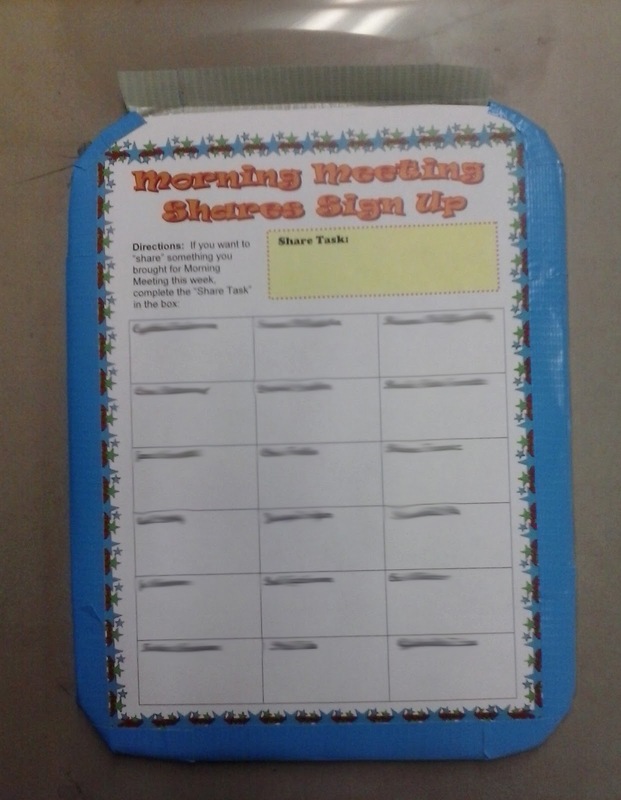 But my class LOVES share time during Morning Meeting. It's funny how the group dynamic changes from one year to the next. Last year's group just wanted to get to the game portion of Morning Meeting and couldn't care less about sharing. This year I have so many kids bringing in stuff from home to "share" that if I let them, they'd be sitting around in Meeting chatting for hours. I'd been pulling names out of a hat each morning, but I felt like some kids were luckier than others in terms of having their name chosen. I didn't want any child who was eager to share have to wait over a week have a chance to be heard. 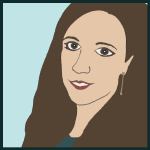 What I wanted was a system for posting names on a weekly basis. It didn't have to be big, but I didn't want to use more paper than I had to (we're already running out this year). Also, at this point in the year, I want the children to be independent and sign up in the morning on their own without my help (after all, they're already good about heading over to the Share Table to drop off their item, so it would be easy enough to sign up over there). The posting didn't have to be big (I don't have any wall space to spare for another bulletin board) and I want it to be fairly close to our Meeting area for easy access. Some of my whiteboards are unsalvageable. I've seen the Pinterest posts about Turtle Wax, but I'm sure these are too far gone (warped and creased) to be saved. I was very close to throwing a bunch out, but couldn't bring myself to do it. The whiteboard would be nice and sturdy like a clipboard, and a transparency sheet over the names would mean no need for a new signup sheet each week! The first thing I did was put my roster into table format, as opposed to a list. I thought it would help students find their name quicker, and I wanted a good sized space for them to write. More ideas on what to write later. 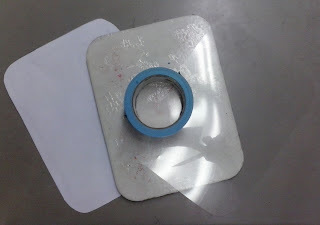 I traced the whiteboard to cut out the paper and transparency sheet to fit perfectly. Once everything was the right size, I dug out my Duck Tape. I picked some up AGES ago knowing it would come in handy some day, but I wasn't sure of the best use for it. I taped the paper at the bottom and the transparency at the top to hold each in place. 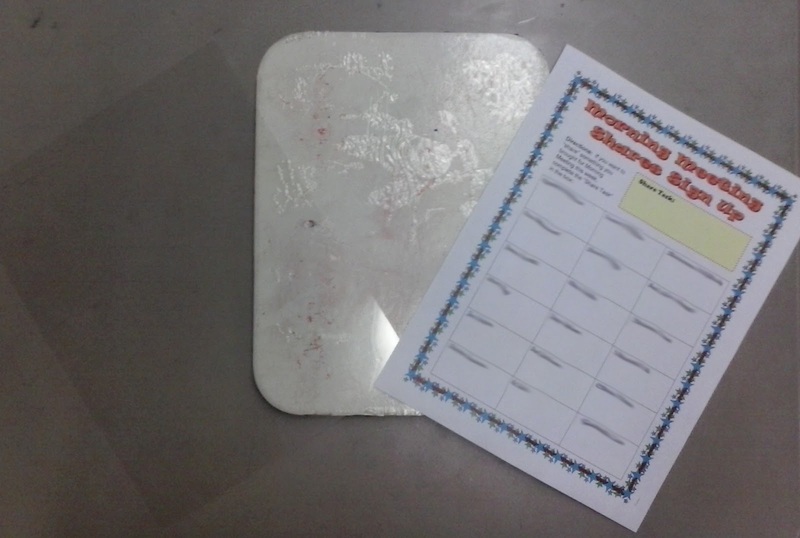 The transparency sheet can flip up if I need to change the names (one of my students might be moving soon). 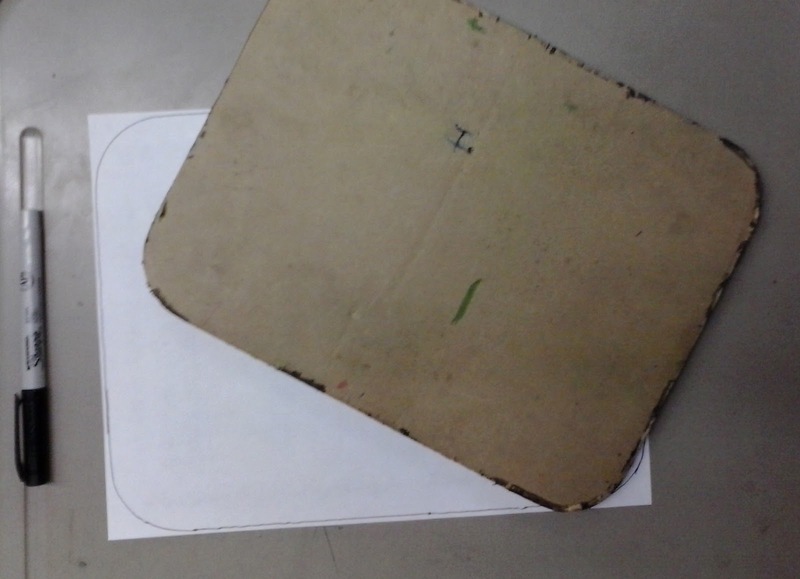 I lined all the edges of the page to secure it to the board as well as for decorative purposes. They're not the neatest Duck Tape edges you'll see on Pinterest, but form follows function, and so far so good. The sign up board was taking shape to be just what I need it for. I tied a pen to the board, and taped the twine so that it wouldn't slip. And that's it! The sign up board is complete. 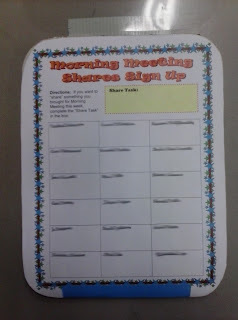 As for the sign up process, I have lots of ideas about how to use this sheet for MY purposes. If the kids are so eager to share, I'm going to make them work for it! You can see that for the first week, they just have to put a check in the box to sign up. However next week, they will need to write a multiple of 7. The week after, a factor of 48. The week after that, a related word for "said." And so on and so on! 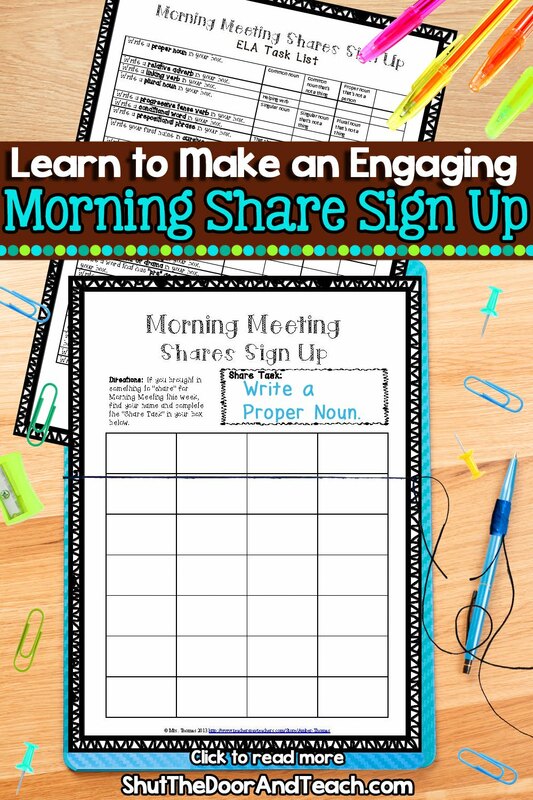 If you could use an editable sign up sheet for Morning Meeting (or any purpose, really) I have it available as a free download here on my blog. 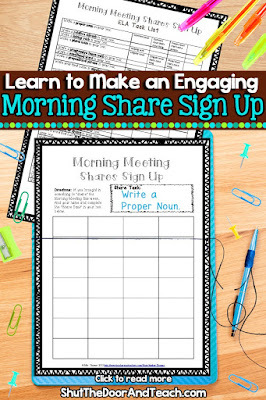 You don't even have to complete the above craft (unless you love it) if you're content to make a copy each week to put on a clipboard. 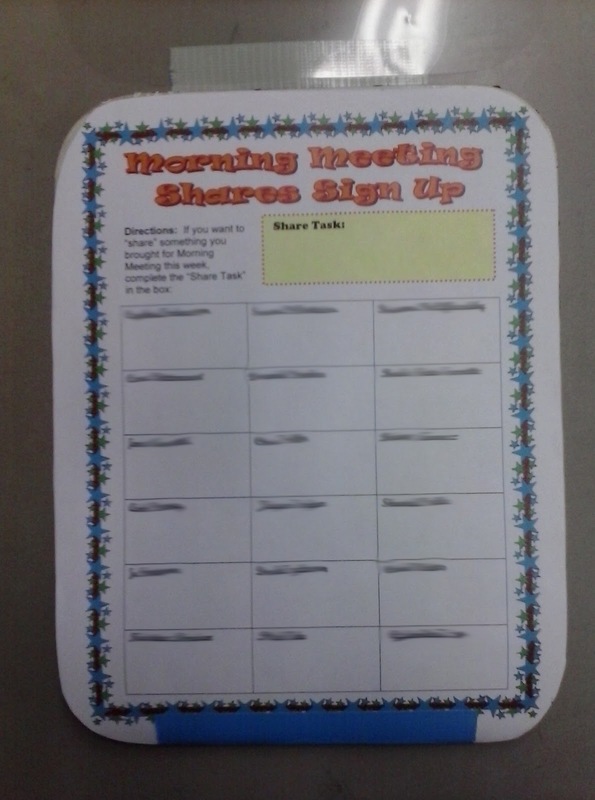 Otherwise, please share with us, do you have any tricks for managing "shares" during Morning Meeting?